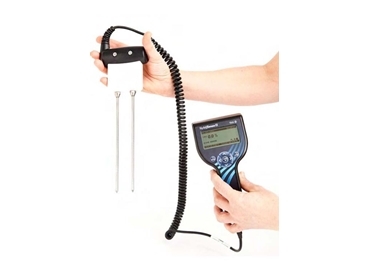 The Hydrosense II CD660, now available from Campbell Scientific Aust , is comprised of a hand held display and portable soil moisture sensor, and is intended to replace the company's original Hydrosense soil moisture system. Designed to be compact and portable, these soil moisture sensor systems feature a new handheld display, and a new easy insertion probe design. The compact nature of Hydrosense II systems means they can be easily operated using one hand, with a 3 inch LCD display and four navigation buttons also added to the design to make changing settings and taking measurements as easy as possible. When measurements are taken, an integrated GPS tags each one with a latitude and longitude. Zones can be created on the unit which group measurements together so that average soil moisture can be calculated for an area. The current position and zone are shown on the display so that measurements can be taken in the same zone. Up to 1500 measurements can be stored on Hydrosense II soil moisture sensor systems. This data can then be downloaded to a PC via Bluetooth for viewing and archiving. a probe redesign for easy insertion and removal from soil.